You are probably thinking that “skinny” and “fudgy” aren’t two adjectives that can go side by side when describing brownies, or at least brownies that taste good! Well, they can when describing these brownies. No “weird” ingredients required! While I have had good brownies that were made with pumpkin and black beans, I know people who wouldn’t even touch them because they knew what the brownies contained. These brownies are perfect for those skeptical people. The ingredient used to replace the butter/oil in these brownies is Greek yogurt. I frequently use plain Chobani, and it is one of my favorite ingredients to use in baking as a way to reduce fat. It still gives a rich flavor to these brownies without adding any weird texture or aftertaste. Throw in just a few mini chocolate chips to add to the fudgy-ness of the brownies and you won’t even miss the butter and oil. 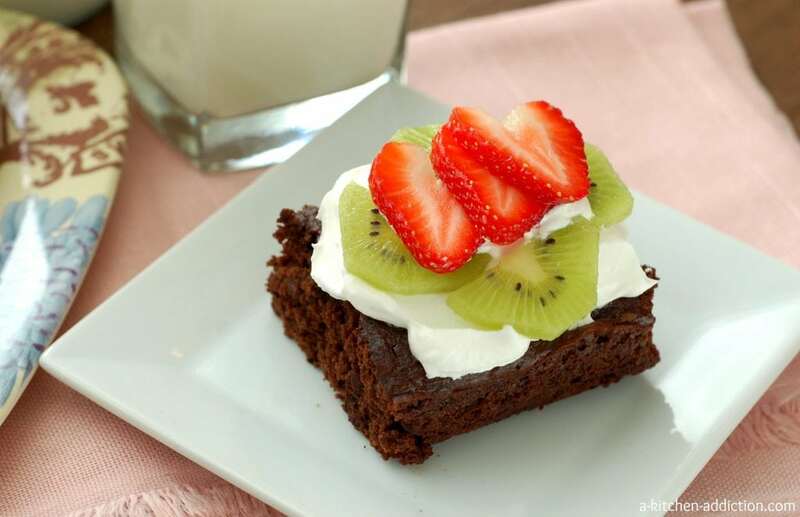 Top the brownies with a dollop of whipped topping and some fresh fruit for a Valentine’s Day dessert that you won’t regret the next day. Oh, and if you aren’t worried about calories, a little drizzle of hot fudge would be great, too! Notes: You do not want to over bake these brownies. They will lose the fudgy texture and become more cake-like. Also, these brownies cut best using a plastic knife. Preheat oven to 350. Lightly spray an 8×8 inch baking dish with non-stick cooking spray. In a large bowl, whisk together flour, sugars, salt, baking soda, and baking cocoa. In a small bowl, whisk together yogurt, egg, milk and vanilla extract until smooth. Add wet ingredients to dry ingredients and stir until just combined. Stir in mini chips. Spread batter into prepared baking dish and bake for 20-25 minutes or until toothpick inserted into the center comes out clean. Do not over bake. Allow to cool for 5-10 minutes before cutting into pieces. Note: These brownies cut best using a plastic knife. This recipe is linked with Friday Blog Hop, Strut Your Stuff Saturday, Weekend Potluck, What’s Cookin’ Wednesday, What’s in Your Kitchen Wednesday, What’s Shakin’. Yeah! I can truly have it all! Delicious chocolate brownies, but less fat! Wonderful! Oooo, these look super yummy! I love baking with Chobani. Yum! Very smart to use yogurt. Your brownies look awesome. YUUUMMM-OOOOOOOOOOOO! Greek yogurt can do miraculous things. These brownies look amazing! Those look so delicious covered in fresh fruit, so hungry now! LOVE this!!! I always want a brownie. Always. I am such a sucker for brownies, and I love finding new healthier dessert options. Thanks so much for this great recipe! I am relieved we did not receive the black bean brownie recipe today heehee 😉 These look lovely! and I especially love all that fresh fruit you piled on top. Perfect V-Day dessert for sure! I love skinny-chocolate-anything! Beautiful, especially with fresh fruit. what a creative recipe! yum. These look amazing! These are so pretty! I love a good healthy brownie. Great recipe! I definitely want to try these brownies! Love these, they look so YUMMY! Love the fruit on top also! How fabulous! I love that you used yogurt in these brownies! Yum! Yum! After all of the indulgence of the holidays and then straight into Super Bowl food I think this looks like a great, lighter Valentine’s Day idea! MMmmmm I could eat the entire tray! OH MY GOSH! I have everything in my pantry to make these babies! Woohoo! these look great!! bookmarked it for my next brownie craving!! 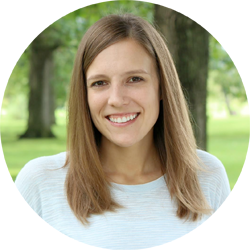 Love this idea Jessica! I’ve never completely replaced the butter/oil with yogurt for fear it wouldn’t work, but these brownies look seriously fantastic! Quick and easy! Sign me up! 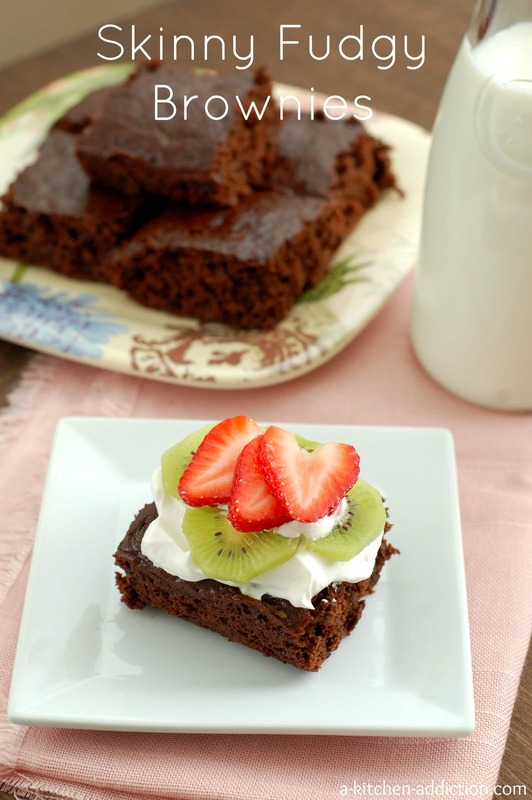 I love that you used Greek yogurt – I am one of those people who just can’t even try black bean brownies on principle 🙂 Love the fruit on there too! No way! These look incredible Jessica! Ooooh, yum! These look wonderful. Greek yogurt is so great for baking. I’m sure teh texture of these brownies is awesome. oooh, these sound amaazing! skinny desserts with real ingredients are my fave! These look delicious Jessica! Love the pile of fruit on top! 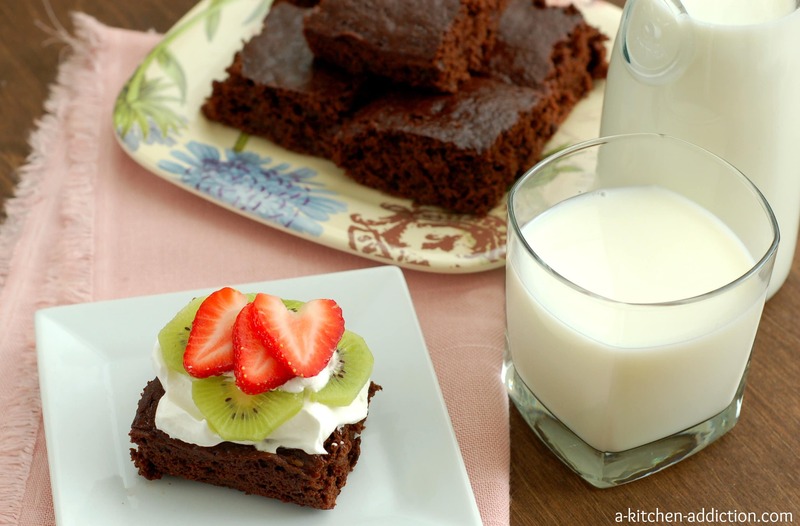 I love using Greek Yogurt — bet these brownies are delicious! OMG they look SO fudgy! Seriously — fudgy brownies are the bees knees. I can’t resist them and their wrinkly tops! I can’t believe you got the fudgiest, gooiest brownies by using Greek yogurt. Totally genius. Can I use 1/4 whole wheat flour + 1/4 all purpose flour and regular non fat plain yogurt? The whole wheat flour may give it too much of a heavy texture, but they should bake up fine apart from the change in texture. You can definitely use plain yogurt in place of Greek yogurt. Hope that helps!